I have three words to say to this pizza: Get in my belly. Wait, that's four. 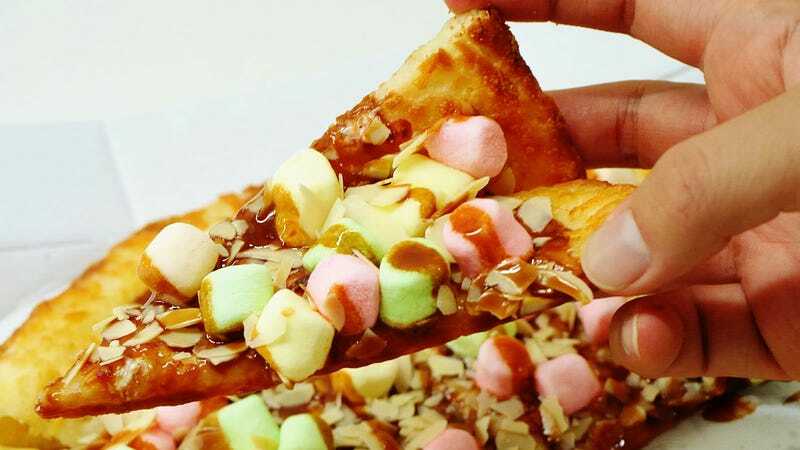 Pizza Hut is releasing a special Morinaga Milk Caramel and Marshmallow pizza as part of the candy's one hundredth anniversary. Below, you can see photos, courtesy of website Gigazine. Just look at it. No dammit. Out of the box. There we go. It's glorious. You are looking at caramel sauce, among other things. On a cheddar cheese hand-tossed crust. Um, okay! Available in Japan until June 30, the pizza only comes in medium and is priced at 800 yen (around US$8).